A reviewer for the Louisville Herald wrote, "Charlie, by himself, creates all the action that is necessary to produce the laughs for which he has become noted, and there is no doubt that this is the most exacting role the comedian has ever essayed." Although the film's title suggests the action is supposed to occur at about one a.m., when Charlie arrives home in the taxi cab, it is quite bright outside. Edna Purviance's absence from the cast was a rarity. Apart from Chaplin's first film after leaving Keystone Studios, His New Job, One A.M. was the only Chaplin film from 1915 to 1923 not to feature Purviance in some role. 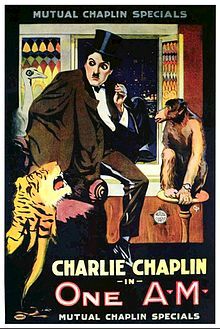 Wikimedia Commons has media related to One A.M. (1916 film).